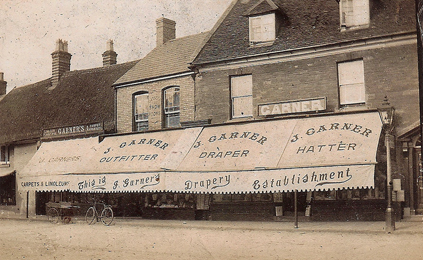 Mr J J Garner’s diary entries provide a valuable insight into the running of a successful drapery business in a small country town during the first half of the twentieth century. The entries will also be of great assistance to anyone attempting to establish dates or time lines for events in Olney. The entries have been selected and collated by Mr Roger Gooden (Mr J J Garner’s grandson) to provide a series of lists that will be of interest to readers with family connections to Olney. This web page, the first of three, presents by far the largest list and covers the set of general observations recorded by Mr Garner over the period 1903 to 1941. Entries are particularly enlightening for the duration of WW1 (05/08/14 – 11/11/18) on this web page and on the third web page for the early days of WW2 (15/09/38 – 30/12/41). Even though almost all of the personal references have been removed, they demonstrate the anxieties and typical involvement of Olney’s civilian population over that period. 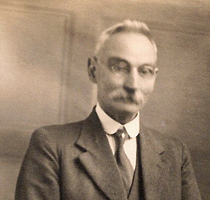 The second web page presents two lists covering Mr J J Garner’s diary entries regarding his staff and other Olney people. The third web page also presents two lists covering Mr J J Garner’s entries during the early days of the Second World War (unfortunately he did not add any entries after 1941) and his entries regarding other shops around the Market Place. 25/03/03 Began Coop front alterations next door. 18/05/03 George Eaton boarded passage. 20/06/05 Perkins propping Allabartons roof. 23/10/08 Morgan put glass name on door. Olney for India, after marrying Jack Longland. 01/07/26 Mr Mont Farrell & Family called on us (from America) formerly 24 Markt Pl. 10/12/27 Lamp for Ravenstone Chapel outside. 26/03/36 Sale of property next door at bottom of garden. 30/10/39 Began alteration to Hoddles Butchers Front – last bit of old OIney Market Pl. 04/11/39 Miss Brimley takes on Mrs Paggett’s cottage. Putting Hoddle’s front in. 31/12/40 No 20 (shop) rated at £7. No 23 at £15. Manse at £34. 18/09/41 Miss Minard spoke about leaving.